Despite the high heat here, in Texas, I spent a delightful weekend among friends in Austin. I took Stephanie Rubiano's amazing "Magnetic Personalities" class at her beautiful home. I traveled with my good friend, Sally Turlington, who was kind enough to drive us in her new car, while showing me the features of her new i-phone...very cool! Upon arriving in town, we met up with Stephanie and our friend, Kim Loya. The first spot we hit was the infamous Uncommon Objects. Uncommon has the most eclectic mix of things you've ever seen. In amongst the giant clown shoes, stuffed terriers (sorry Maggie!) and vintage store display pieces, you can find all kinds of interesting baubles. ...and swipe these tiny cigar boxes out from under poor Stephanie. But, in the end, they forgave me for my over-zealousness. Don't worry, I left a few things for them (wink!). Next stop was Stephanie's home and studio where we met up with the lovely, Diane Cook. Steph graciously allowed us to wander and take photos. Let me tell you, Stephanie's workspace is filled with inspiration. She has such a gift for arrangement as well as an incredible creative vision. ...which is fabulous, as well and filled with artwork by Stephanie as well as by many other artists. Actually, if you get a chance to take any of Stephanie's classes, you should jump. She's so knowledgeable and, like I said, she's got that creative vision that turns everything she touches into gold. In this class, we got to play big-girl paper dolls all day. We created a doll from special materials (not just paper, after all) and worked on their wardrobes which was a kick. Stephanie taught a lot of useful techniques, including waxing some of the clothes. Fun stuff! I was lucky enough to acquire one of Stephanie's "Perching Pixies." This one stands in a little tin teapot that reminds me of one my mom had as a kid. This wasn't really a garage sale in the garage sale sense of the word. It was inside, for one thing (thank you God, for that, as it was 103 outside!) and the place was filled with vendors; like an antique mall but with way, way better prices! ...my friend, Katy, from Beads by Sandy...yay! Much as I love my vintage pull-down maps, old green fan, crusty little chair, cabinet cards and other goodies, my find of the day was this shabby chic birdcage, I picked up for a song (pun intended). Wife Whisperer tried to put it on the curb last night for the garbage men but, luckily, I caught him! Thank you, Stephanie, for a wonderful weekend. Isn't she lovely? I'm off to Austin with some artsy friends to do artsy things. Sally, Diane and I will be traveling to the home of my other artsy friend, Stephanie Rubiano, for a day of creating our own "magnetic personalities." Stephanie will be teaching this class at Artfest, but I'm thrilled to have a semi-private lesson! I'm not really much of a doll maker but I jumped at the chance to take a class with Stephanie. She's one of those artists who come up with the most creative ideas and everything she touches is incredibly detailed and well done. So, I should end up with a nice, magnetic personality by the end of the weekend. We all want that...right? Steampunk meets Tiffanys? That's the way Stacy Alexander describes my jewelry on her blog Listen to My Art Beat. Stacy's blog is home to all kinds of artistic inspiration in the form of reviews, links, artist's interviews and photos...tons and tons of photos. I'm honored to be a featured artist for Stacy. Check it out here! ...and had to run out for a few supplies. Well, maybe I didn't absolutely have to run out but it sure was a good hunt. I picked up a few lovely, vintage boxes because every girl needs a dozen jewelry boxes...right? ...maybe some flowers or tatting? I picked up this gorgeous, glass lined dresser tray for a song...you saw it in the first photo. It was marked "as is" but I didn't see a thing wrong with it. Just because the colors of the fabric are a bit faded or the handles are a little warped? It only adds to the enchantment. I'm not sure what this little thing is. At first, I thought it was a charm but there's no hole or ring. It's a tiny pipe...with a face. Very interesting! ...or this watch. Don't you love the vintage patina? There were two of these and I thought I might be able to use one in my project but it didn't turn out to be so. The embroidery is very fine and I'm sure I'll be able to use them elsewhere. ...full of teeny, tiny tintypes. 45 of them! They're the smallest tintypes I've ever seen. Each one is under an inch high. Not only that, the album itself is precious. 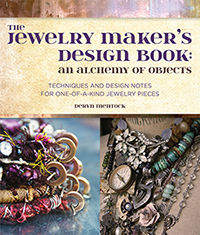 This little book is a treasure trove of jewelry making, mixed media goodness. Lucky, lucky day! While I was in Birmingham, DJ, myself and some of the students went on a little photo safari. Turns out, there are lots of old churches and interesting buildings in Birmingham. Our little hike was short, but there was plenty to shoot. Oh, what fun we had tromping through the streets. ...and even a man who asked us, from his car, why we were taking pictures of a tree. ...it's one of my favorites...for obvious reasons. Or, maybe not so obvious! "Prayers For The Girl Who Washed Away"
This week is my turn for the design team, featured artist's interview on the Objects and Elements blog. The week that I worked on this necklace, we'd had torrential downpours in Houston. I was listening to the radio as I worked and a news story came on about an accident that had happened. A man had driven into a bayou, during the storm, while trying to answer his cell phone. There were six children with him, all under the age of 10, and all but one drowned. When the story came on the radio, one of the little ones had been found, some days later, and the announcer prefaced it with the words "the girl who washed away." It really struck me and I thought about that little girl for a long time after. The recycled sari silk that I used in the piece reminded me of prayer flags. It was later learned that the driver was drunk as well as distracted. In addition to the sari silk, I also used bronze wire, Roman glass (ancient and very cool), heishi, and bronze "bullets" all from the O&E store. I hope you'll visit the O&E design team blog and read all the artist's interviews. Remember this girl (on the left), Ronnie? We skipped out one day, during our Birmingham trip, for a little adventure. Our goal was to go treasure hunting and, despite the extremely hot and humid day (and I do mean extremely! ), we decided to walk. Dentists must have some innate ability to hike in blazing conditions. Ronnie bobbed along, barely even breaking a sweat as I wilted. In Houston, we have the good sensed to stay in during the heat of the day. But, junk shops were calling. It was a long, long walk. Thank goodness for frozen coffee drinks! ...and, after a couple of closed stores, a strategically placed coffee shop, and one very mean junk collector, we landed in goodie heaven. I think we walked about 25 miles. Well, maybe not 25 but it sure felt like it. I was glad to see a drop of sweat finally break out on Ronnie's brow. The truth is, when we finally arrived at the antique place, we both nearly collapsed in gratitude for the amazing delightfulness of air conditioning. But...there were treasures to be found and purchased. I fell really hard for this beautiful, popcorn crochet bed throw. It weighed about 50 pounds and, when I packed to leave, the bulk of it was a little tricky to squeeze into my suitcase but determination won out and I finally coerced it in. ...and, in the end, couldn't resist it's groovy 60's charm. ...and, my deal of the day, this mother of pearl piece for 6 bucks! Sweet reward for all that walking! We rolled back into the hotel, sticky but happy. Ronnie, I'd do it again in a heartbeat. I'm back from teaching in Birmingham and am feeling the glow of a fantastic trip. We all had such a terrific time! Not only were the classes great, but the area we stayed in had tons of really wonderful restaurants. The food was great and the company, even better. It's always a pleasure to spend time with my friend, and fellow teacher, DJ. DJ and Ronnie (previous post) are the type of good friends that I can pick up with like we'd never been apart. In addition to all that, the students were just absolutely delightful...friendly, creative and fun. Among the new faces were a few acquaintances from the internet and from other classes. A huge thank you to each and every one. It was such a joy being with you all! As much as I'm not crazy about traveling and leaving my guys, this trip reminded me how much I love to teach. As you can see, the venue was great for us. I just realized, I forgot to get a photo of my jewelry all set up (thank you Ronnie for assisting). I had emptied my etsy store to take things with me but have added back a few things that were left. I was amazed that someone actually paid me for some jewelry...by paypal...in class...with her iphone. Cool, eh?! I have to thank Joyce Vance, especially, for organizing such a terrific event. I know how much work it must have been but she carried it all off with style and grace. She also did some incredible work in class and even blogged about it...on her iphone...from class. Again, amazing! I might have to get one of those gadgets! I'm off to Birmingham to teach "Mingled Elements" with my dear friend DJ Pettitt. DJ is such a sweet and creative person and we always have a great time together so I'm really looking forward to it. The Birmingham gals look to be a wonderful group and I can't wait to see a few friends there, as well. In the interest of keeping my sanity, I've decided to teach only a couple of times a year. My next workshop will be at Art & Soul in my hometown, Portland, Oregon...in October. This is going to be such a fun workshop! It's two days because there was just too much technique and too many elements to fit into one. If I don't see you in Birmingham, I hope to see you in the Portland workshop! (For details of my class, click here). While I'm gone, take a look at my mini interview at Craft Gossip...thanks to Barbe Saint John.